Because the I-129 at 39.6 keV, and Pb-210 at 46.5 keV, have energy peaks so close together, it can be difficult to tell them apart with a NAI scintillator. If they are present at the same time, the peak that shows will drift toward the 39.6 kev if more I-129 is present, and towards 46.5 keV if more Pb-210 is present. Radioactive I-129 is a lot less radioactive than the I-131, they are both released during a nuclear reactor melt down, at a fixed ratio of 3 parts iodine-131 to one part iodine-129. Half life 1-131 8 day, in the environment 80 days +. Half Life I-129 15.7 million years. I-129 very tiny amounts can also be naturally produced in the upper atmosphere, by a process called cosmic spallation. 1-129 can bio-accumulate in the environment and in food. The questions being debated here are. A. If it is a I-129 detection, is it from the Fukushima Nuclear Disaster? C. Would it be wise to take Iodine supplements, if a significant extra amount of it was being released into the environment, and bio accumulating? This is a reply by poster Potrblog on https://www.enviroreporter.com I think it is a very good answer to the questions above. “A: There is no 100% quantitative way to tie it to Fukushima, you can only make qualitative correlations based on the magnitude detected vs what would be expected, and other factors like opportunity and timing. Taking Iodine supplements is a question people have to decide for themselves. Iodine supplements are not for everyone. We are all different. Some people taking them can get adverse side effects. No one should take them without medical advice from their doctor. The possible I-129 detection here is very small, and not conclusive. The other isotopes detected in the May rain test are also of concern, but at trace levels at present. Beryllium Be-7 being the most prominent. 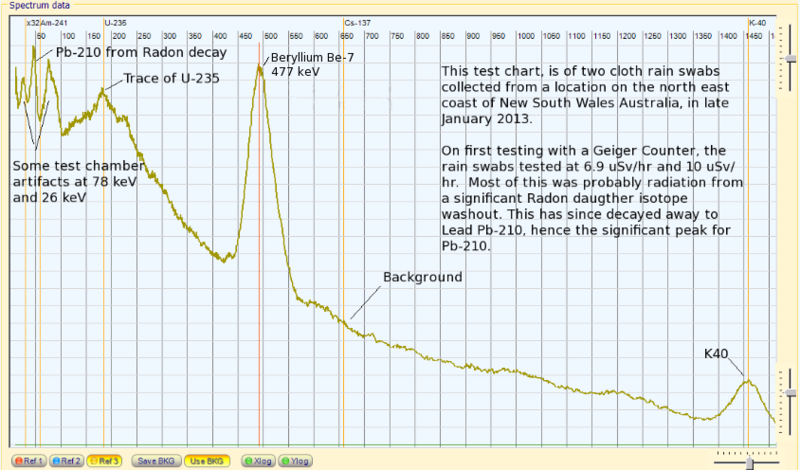 Is this proof, that some of the Beryllium Be-7 in our rain tests here in Australia, is from Fukushima? and alternative views on the test results. Read this previous post in the EnviroReporter “Radiation Food Lab”, to get information on why a I-129 detection is a pointer to Beryllium Be-7 coming from Fukushima. Looks like a detection of Iodine I-129 from the tin roof down pipe polyester filter. It was collecting rain off a 36 sqm tin roof at my location. If it is, it is still a very small detection of I-129, because the filter was in place for all of May. Mind you, not all of it would have been captured using this filter system. Lots of Beryllium Be-7 is also present! If this is present in the Southern Hemisphere, it would suggest that there is a lot more in the rain in the Northern Hemisphere! 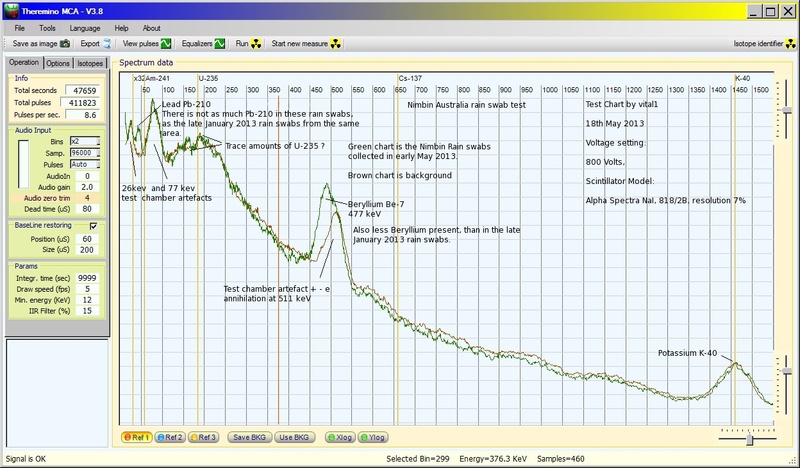 Nimbin Australia has been getting huge Radon washouts this year. The rain swab test charts from that location have been showing lots of Lead Pd-210 and Beryllium Be-7. Lead Pb-210 is the end isotope of the Radon daughter decay chain. Because the I-129 at 39.6 keV, and Pb-210 at 46.5 keV, have energy peaks so close together it can be difficult to tell them apart with a NAI scintillator. If they are present at the same time, the peak that shows will drift toward the 39.6 kev if more I-129 is present, and towards 46.5 keV if more Pb-210 is present. The experimental Theremino MCA V4.5 software used in this test is a bit noisy near background. 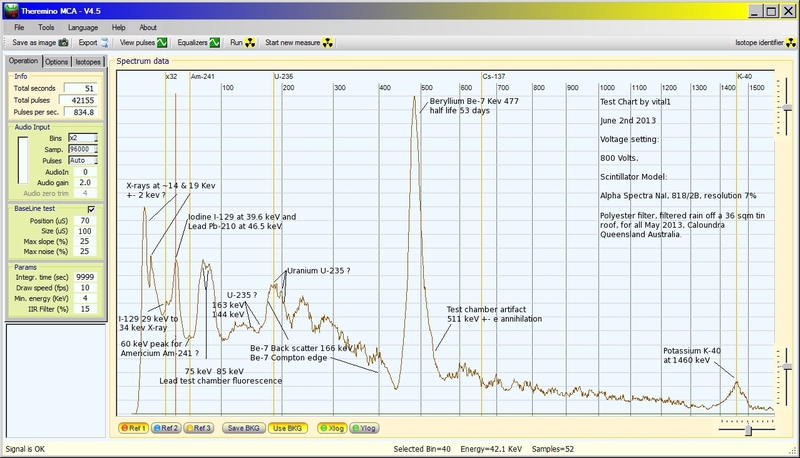 It is a lot more sensitive than the other scintillator MCA software I use. It is just that the noise at low CPS activity can make it harder to interpret isotope peaks. Disclaimer: I am an amateur. Human error can provide incorrect information, and equipment malfunction can produce false readings. Do not rely on, or take action upon information presented here, without further research. The May 2013 monthly average was 7% above the pre-Fukushima monthly average for May. This is the same as May 2012. (See charts below) This would suggest that at our location, background radiation levels have stabilized for the time being. We now also have in place a new live monitoring station in Australia, near Melbourne, at Grovedale in Victoria . The live Grovedale Victorian Australian charts can be found on this page. 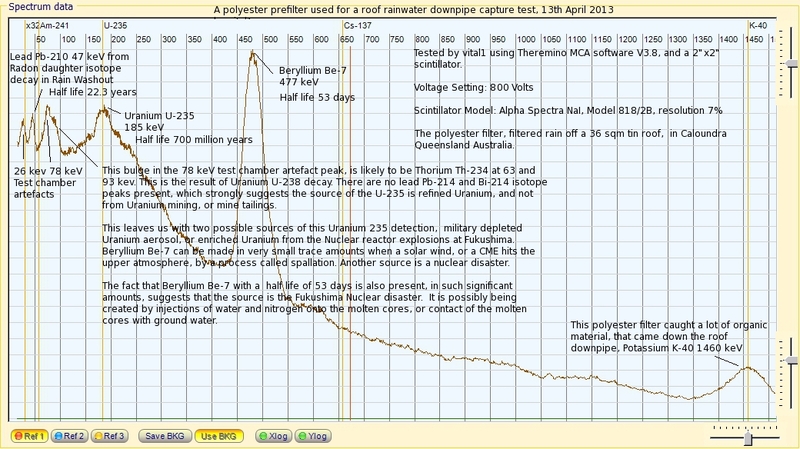 Scintillator rain swabs test chart, for the 2nd and 11th May alert level rain event, at Nimbin Australia. It appears to be another very large Radon washout. The levels of Lead Pb-210 and Beryllium Be7 detected in these rain swabs, is much less than the Nimbin late January, and early February 2013 rain swabs. Lead Pb-210 is the end product of the Radon isotope daughter decay chain. April 2013 report on local background radiation levels, and rain test results. April’s month average 9%, is lower than last years April 12% above average. Which brings us back to the Radon daughter isotopes, Uranium U-235 and Beryllium Be-7 as the main detected components in the latest April rain tests, collected at this location. 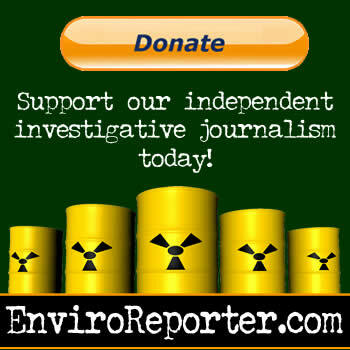 Even though the refined Uranium was detected is in trace amounts, its presence is of considerable concern. As the seasons change from summer to winter, the Northern Hemisphere mixed tropical air, flowing into the Southern Hemisphere, is replaced by the Southern ocean air flow, and our radiation levels drop. Here is a link that shows global air flow circulation. As you can see, thin fingers of air come from the tropics deep into the Southern Hemisphere. This happen more in summer than in winter. Important Note: Since the Mullumbimby late January and early February 2013 detection reports were posted, at http://sccc.org.au/archives/2630, the owner of the Gamma Scout Geiger counter, reported his unit had developed a fault. That fault was investigated, and the unit has since been repaired. He now has a Gamma Scout Geiger Counter, and a Theremino Geiger kit set up with multiple SBM-20 Russian tubes. This means he can now cross check between units, to verify each unit is working correctly. This brings into question his reported detected levels, for late January and early February 2013, at his location in Mullumbimby. Multiple Geiger counters at different locations, spread over a wide area, detected elevated local background radiation levels during this event. 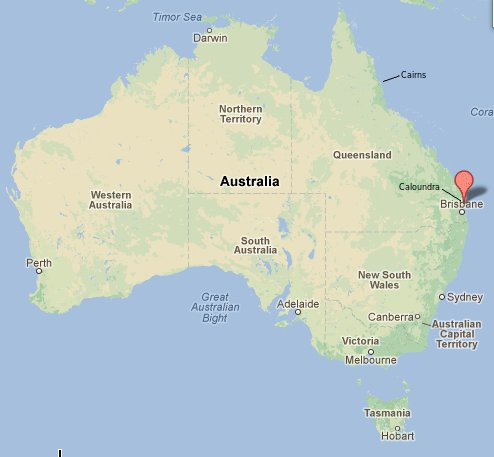 This was from the Sunshine Coast in Queensland, to the Northern New South Wales East Coast. The highest detections where on the Northern New South Wales East Coast. The other units used by people at different locations were all reported to be working correctly during this time, and still are. Most of these private monitoring stations have multiple Geiger Counters to cross check against, so they can verify detections.